I've got mixed feelings about this book. On the one hand I really enjoy Atwood's writing, her prose is just fantastic, on the other, I'm not into the story and I'm not caring at all for any of the charatcters, especially the main one. Jimmy is such a bore and the psychopath of Crake is just much of a typified genius-gone-mad. 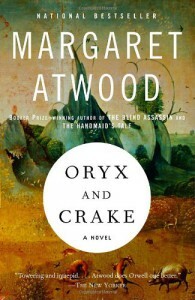 and Orynx is just a manic pixie dream type of girl, too one-dimensional... bah, maybe I'm just not really into dystopian fiction, though I have yet to read The Handmaid's Tale. I feel it's such a pity that I'm not loving this book, I really wanted to like it, but perhaps my opinion will change as I finish this one... We'll see.